C4 plants such as corn and sugarcane assimilate atmospheric CO2 into biomass by means of the C4 carbon fixation pathway. We asked how PEP formation rate, a key step in the carbon fixation pathway, might work at a precise rate, regulated by light, despite fluctuations in substrate and enzyme levels constituting and regulating this process. We present a putative mechanism for robustness in C4 carbon fixation, involving a key enzyme in the pathway, pyruvate orthophosphate dikinase (PPDK), which is regulated by a bifunctional enzyme, Regulatory Protein (RP). The robust mechanism is based on avidity of the bifunctional enzyme RP to its multimeric substrate PPDK, and on a product-inhibition feedback loop that couples the system output to the activity of the bifunctional regulator. The model provides an explanation for several unusual biochemical characteristics of the system and predicts that the system's output, phosphoenolpyruvate (PEP) formation rate, is insensitive to fluctuations in enzyme levels (PPDK and RP), substrate levels (ATP and pyruvate) and the catalytic rate of PPDK, while remaining sensitive to the system's input (light levels). The presented PPDK mechanism is a new way to achieve robustness using product inhibition as a feedback loop on a bifunctional regulatory enzyme. This mechanism exhibits robustness to protein and metabolite levels as well as to catalytic rate changes. At the same time, the output of the system remains tuned to input levels. A class of biological circuits was recently described with robust input-output relations [1–4]. In these systems, the output, such as the concentration or activity of a specific protein, is perfectly insensitive to variations in the concentrations of all of the system's components, and yet responsive to the system's input. Such robust input-output relations are difficult to achieve, because in most conceivable mechanisms the output is sensitive to variations in the concentrations of the circuit components. At the heart of these robust mechanisms are bifunctional enzymes that catalyze two opposing reactions. The first example analyzed in detail appears in bacterial two-component signaling systems, in which a bifunctional receptor confers a robust input-output relationship by acting as both a kinase and a phosphatase of a response-regulator protein [1, 2]. A second case of a bifunctional enzyme tied to robustness was studied in the glyoxylate bypass control of E. coli metabolism, in which the activity of isocitrate dehydrogenase is made robust by a bifunctional kinase/phosphatase . A third example appears in the nitrogen assimilation system of E. coli, in which glutamine synthetase is controlled by a bifunctional enzyme that both adenylates and de-adenylates it . Although all of these systems rely on bifunctional enzymes, each system does so with important differences. Thus, robustness relies in each case on the biochemical details of the system. In the two-component signaling case, robustness relies on an auto-kinase and phosphotransfer reaction by the receptor, as well as on the receptor phosphatase reaction being ATP-dependent. In the case of the glyoxylate bypass, robustness depends on saturating one of the sites of the bifunctional enzyme with substrate. And in the nitrogen assimilation case, robustness depends on avidity of the bifunctional enzyme to its multimeric substrate. Thus, in each case studied so far, there is a different detailed mechanism for robustness. It is therefore of interest to describe additional systems with bifunctional enzymes, in order to discover new potential mechanisms for robustness. Here, we consider the plant carbon fixation cycle which employs a bifunctional kinase/phosphatase. The wealth of unusual biochemical features in this system makes it an interesting candidate for seeking a new mechanism for robustness. We next describe the reactions in this system and evidence for its robustness. We then propose a putative model for how robustness in this system can arise based on its biochemical architecture. C4 plants such as corn and sugarcane use an enzymatic cycle to promote the assimilation of atmospheric CO2 into biomass. A key step in this cycle is the conversion of pyruvate to PEP by the enzyme pyruvate orthophosphate dikinase (PPDK) [5, 6]. 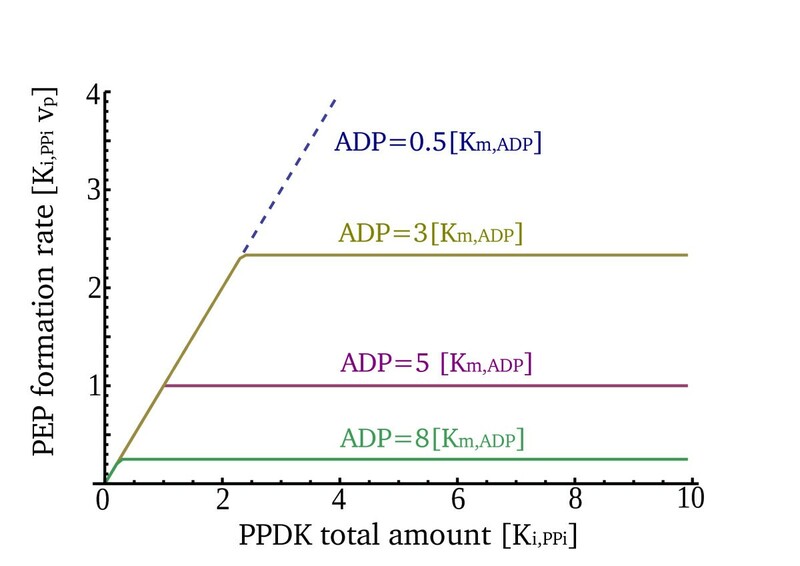 The activity of PPDK, namely the rate of PEP production, is controlled by light (because PPDK needs to be correlated with the photosynthesis rate, PPDK activity having the highest correlation with the photosynthetic rate, r = 0.96 ). Light level is encoded in the cell by the concentration of ADP: high ADP means low light, and low ADP means high light (see [7–11] and references therein). For simplicity, we will consider ADP levels as the input of the system, and PEP formation rate as its output. The C4 pathway has three main types, two of which decarboxilate malate to pyruvate (by NADP-ME and NAD-ME enzymes) and then utilize PPDK as a crucial enzyme in the CO2 assimilation cycle . Plants that employ these two types include maize, sugarcane, sorghum and millet. The third C4 type has the PPDK enzyme (and sequential cycle), but also has an additional decarboxylation pathway through PEPCK (phosphoenolpyruvate carboxykinase) which transforms oxaloacetate to PEP. In this third C4 pathway type, PPDK may be less crucial than in the first two types . PPDK is one of the most abundant enzymes in the biosphere , constituting about 7-10% of the protein content of mesophyll cells . It is maximally active as a homotetramer. When subjected to cold temperatures it dissociates into dimers and monomers, making it mostly inactive. The PPDK enzyme produces PEP and is regulated by the bifunctional enzyme RP. Pyruvate, orthophosphate dikinase (PPDK0) uses ATP and Pi to produce phosphoenolpyruvate (PEP) from pyruvate. It does so in two stages: first, it auto-phosphorylate itself to its active form (PPDK1). Second, it transfers the phosphoryl group to pyruvate and returns to its natural form (PPDK0). Another regulatory cycle can phosphorylate the active form PPDK1 at a different residue to form PPDK2, the inactive form of PPDK. The second phosphorylation and de-phosphorylation are done by the bifunctional enzyme RP. This enzyme is regulated by ADP levels (an indication to photosynthetic rate). The products of the kinase/phosphatase activity of RP, AMP and PPi, are also the products of the auto-phosphorylation reaction of PPDK0 with ATP and Pi (b) Enzyme activity of PPDK is constant across a range of PPDK expression levels - as measured in a mutated strain of Maize (Zea Mays) by Ohta et al . Mean levels of PPDK expression in non-transformants is measured to be 1.6 mg/g fresh weight). Enzyme activity changes only at extreme expression levels of PPDK (see text). The two phosphorylation steps of PPDK are sequential, meaning that the second phosphorylation of PPDK at the Thr residue can happen only on the auto-phosphorylated form PPDK1, i.e. only after PPDK is in its active form and ready to phosphorylate pyruvate to produce PEP [15, 16]. The bifunctional enzyme RP is inhibited in a competitive manner by PPi . A recent experimental study indicates that the activity of PPDK1 (the PEP formation rate) is insensitive to variations in PPDK protein levels . Ohta et al. transformed a cold-tolerant PPDK gene into maize. The transformation yielded 48 strains each with a different expression level of PPDK. The strains were then measured for PPDK enzyme activity. These measurements show that enzyme activity is nearly insensitive to increasing or decreasing PPDK expression levels: there was only about a 20% change of PEP formation rate despite a 5.7 fold variation in PPDK levels  (for examples in other metabolic enzymes see ). This suggests that PPDK activity is regulated in a way to ensure a robust PEP formation rate (see Figure 1b). The nature of this mechanism remains unknown. In this study, we demonstrate that the detailed features of the system can work together to provide input-output robustness. We propose a mechanism that makes the output (rate of PEP formation) robust to wide variations in the concentration of all of the system components, including protein levels (RP and PPDK) and substrate metabolite levels (ATP, pyruvate). Despite this robustness, the rate of PEP formation is still sensitive to its input signal ADP which corresponds to photosynthetic activity (light/dark). The mechanism proposed in this study is based on avidity of the bifunctional enzyme RP to PPDK tetramers. It also depends on a product-inhibition feedback effect of a PPDK product (PPi) on RP's catalytic rates. We also detail the conditions in which robustness breaks down, such as extreme values of the input ADP, or ultra-low levels of substrates or proteins. We present a mechanism for robustness in the system based on its known biochemical features. The outline is as follows: we first note that the tetramer structure of PPDK makes possible an avidity effect, in which RP primarily acts when it is bound at the same time to two different monomers on the same tetramer. We then show that this avidity effect allows the system to reach steady-state only if the specific rates of the kinase and phosphatase reactions of RP are exactly equal. Finally, we note that such tuning of specific rates is made possible by a feedback loop, in which the rate of PEP formation affects RP rates by product-inhibition (through the shared metabolite pyrophosphate). The upshot is that the PEP formation rate (the output of the system) depends only on the input signal (ADP, which corresponds to light level), and not on any of the protein levels (PPDK, RP), levels of metabolite substrates (pyruvate, ATP) or on PPDK catalytic rate. The full set of equations of the mechanism is shown in additional file 1. The following description aims to allow an intuitive understanding of the mechanism. We denote the non-phosphorylated form of PPDK by PPDK0, the phosphorylated form at the His residue by PPDK1 and the doubly phosphorylated form at the His and Thr residues by PPDK2. Only PPDK1 is active and catalyzes the production of PEP. The bifunctional enzyme RP has two domains, one for kinase and the other for phosphatase activity [20, 21]. This two-domain structure, together with the tetrameric form of its substrate PPDK, provides for a cooperative binding effect known as the avidity effect. Avidity results when one domain of RP, the kinase domain, binds a PPDK1 subunit and the other domain binds a PPDK2 subunit on the same tetramer. where Vk(ADP) and Vp(ADP) are the specific catalytic activities of the two domains of RP. These rates depend on the input ADP . Due to the avidity effect, however, the ternary complex is highly favored relative to binary complexes. Once RP binds one subunit of PPDK, for example PPDK1, the effective local concentration of a neighboring subunit (PPDK2) is increased. As a result, the on-rate for the second binding is very high (typical avidity effects show an on rate that is 100 times or more larger than the first binding rate [4, 22]). Unbinding is rare, because both subunits need to unbind at the same time for RP to leave the tetramer. Avidity favors a ternary complex in which the two domains of RP bind to two adjacent monomers in the PPDK multimer. (a) Illustration of the two domains of an RP enzyme binding adjacent PPDK monomers in a PPDK tetramer. The phosphoryl-addition domain binds PPDK1, whereas the phosphoryl-removal domain binds PPDK2. This double-binding results in high avidity. (b) Reactions for the formation of binary and ternary complexes of RP and PPDK. When one domain of RP binds a monomer, the rate for binding an adjacent monomer by the second domain, kon2 and kon3, is very large. 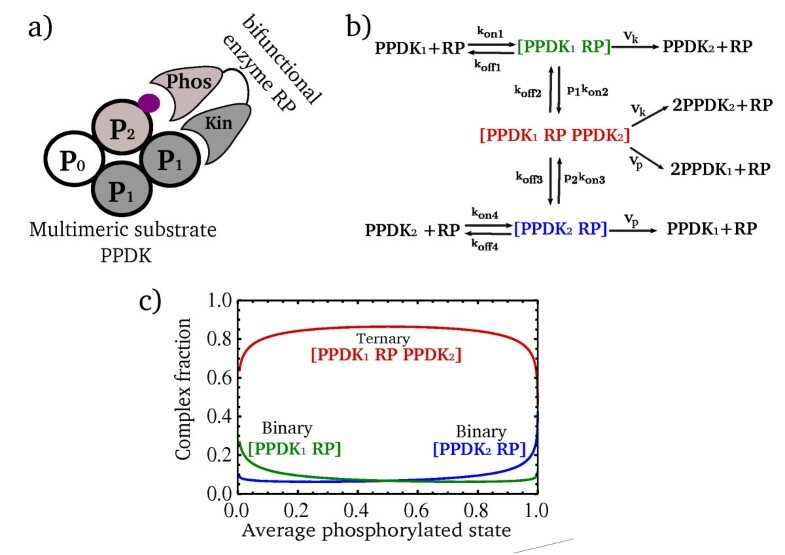 (c) The fraction of RP found in a ternary complex with two adjacent monomers [PPDK1 RP PPDK2] is higher than the fraction found in binary complexes with only one monomer [PPDK1 RP] or [PPDK2 RP], over most of the range of PPDK phosphorylation levels. In this plot the parameters were normalized to koff1 and total RP levels such that kon1 = kon4 = 0.01[koff1/RP], koff4 = koff1, kon2 = kon3 = 200[koff1], koff2 = koff3 = 1[koff1], Vk = Vp = 0.01[koff1] and total PPDK/total RP = 100 [11, 13, 33]. The complex fractions were calculated with a model that takes into account the spatial configurations of PPDK subunits (see Methods). This is a requirement that cannot generally be met, because the input signal ADP changes Vk and Vp in opposite directions (except for a single value of ADP, Vk and Vp are generally unequal). Thus, steady state requires an additional layer of regulation. We next describe an effect due to product inhibition, which can satisfy the steady-state condition, and turns out to provide robustness. Where Ki,ppi = 160 μM is the inhibition constant  and Vp0(ADP) is the maximal phosphatase velocity. Thus, the more PPi in the cell, the lower is the phosphatase activity of RP. Experiments suggest that the kinase reaction of RP is not measurably inhibited by the second product AMP (Ki,AMP > 2 mM, ). Combination of avidity with a product-inhibition negative feedback loop provides robustness to the PEP formation rate. a) A schematic illustration of how the PPi negative feedback leads the output PEP formation rate back to its robust level upon a step addition of PPDK protein. (1) An increase in total PPDK levels leads to a rise in PPDK0 levels. In turn, (2) PPDK1 and PPi rise. (3) PPi rise leads to inhibition of the phosphatase activity of RP (product inhibition) and (4) to a rise in PPDK2 levels, lowering PPDK1 amounts. 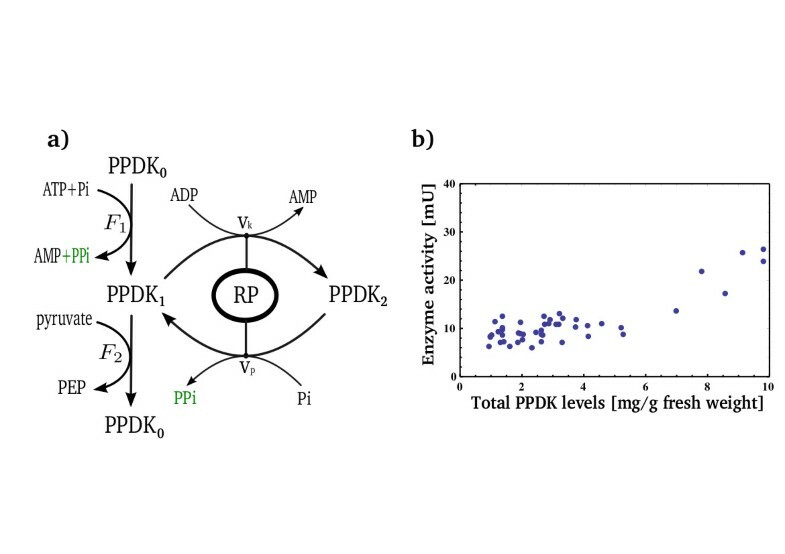 (5) The decrease in PPDK1 yields a decrease in PPDK0 and thus leads to (6) a decrease in PPi and rise of RP phosphatase rate. The robust formation rate, F*, is again attained. Since the avidity mechanism places both the kinase and phosphatase reactions from the same complex (ternary complex), steady-state requires only that their rates are equal (regardless of protein levels). Thus, steady state formation rate goes back to its original state, while the extra amount of PPDK is routed to the PPDK2 state, which acts as a buffer. Grey circles indicate deviations from the initial steady-state and green (red) arrows indicate increased (decreased) levels. b) Schematic illustration of the system's dynamics upon an increase in PPDK total amounts. The numbers in the different plots mark the phases of the system's adaptation back to the robust solution as marked in a). This is the main result of the present analysis. The output formation rate F* does not depend on the concentrations of the proteins in the system, RP and PPDK. It also does not depend on any of the substrate metabolites, ATP, pyruvate, PEP and AMP. The formation rate is thus robust to these potentially fluctuating concentrations as been also suggested by studies in leaves and isolated chloroplasts showing no clear relation between PPDK activity and changes in ATP, AMP, pyruvate and PEP levels (reviewed in  and references therein, see also additional file 2). Despite this robustness, the output rate is controlled by the input signal ADP, which corresponds to light levels. The magnitude of the output (PEP formation rate) in this mechanism is given by the product of the PPi product-inhibition constant and the PPi degradation rate, F0 = α Ki,PPi. We note that pyrophosphatases are abundant in the chloroplast , providing a fast hydrolysis specific activity of 40 μmol/mg chl/min , yielding α ≈100 [1/sec]. Since Ki,PPi = 160 μM  one finds a rate of about F0 = 108 reactions/second per chloroplast (for chloroplast of size 20 μm3 ). This rate magnitude makes sense: the C4 cycle in these plant cells assimilates about 107-108 carbon atoms in the form of CO2 per second per chloroplast at daylight [27, 28] (see additional file 2 for more details). We also studied the conditions in which robustness might break down. The model suggests three cases: The first potential condition for loss of robustness is when there is not enough total PPDK enzyme or substrates to provide the robust rate F* of Eq.(12). The second includes conditions of very low or very high input signal, in which the binary complexes in Eq. (5) cannot be neglected, and avidity is no longer a dominant effect. The third condition for loss of robustness occurs when total PPDK levels are extremely high such that its activity cannot be regulated due to shortage in the phosphorylation substrate (ADP levels). We now briefly analyze these conditions. The first type of conditions in which robustness does not occur is when there is not enough total PPDK enzyme or substrates (ATP, pyruvate) to provide the robust PEP formation rate F* given by Eq.(12). For example, if substrate or PPDK levels are zero, one must have F2 = 0. Solution of the model shows that when one of these factors (total PPDK, pyruvate or ATP levels) goes below a threshold concentration (equal to its minimal concentration needed to reach F*), all of PPDK becomes active (PPDK2 = 0). The formation rate F2 is then linear in PPDK1, F2 = V1(pyr) PPDK1. In this state, the rate depends on protein and metabolite levels and robustness is lost. As soon as PPDK and/or substrate levels become high enough to reach F*, robustness is restored (see Figure 4). The second case for loss of robustness is extreme input levels in which the binary complexes are not negligible compared to ternary complexes. Avidity requires that PPDK exist on the same tetramer in both PPDK1 and PPDK2 forms. However, in extreme high or low signal (ADP) levels, this does not apply. In these conditions, one can no longer neglect the effects of binary complexes (see Methods and additional file 2). 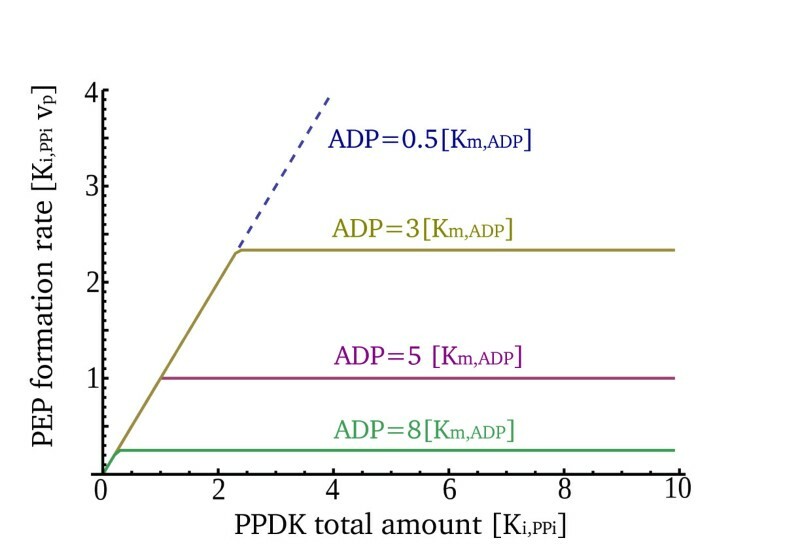 At very low ADP levels (very high light), most PPDK is active and PPDK2 monomers are rare. Ternary complexes are scarce because they require PPDK2. We estimate that robustness begins to erode at light levels below 50 μE m-2 s-1 or above 800 μE m-2 s-1, which is also the mean photosynthetic photon flux at daylight [28, 29]. Thus robustness is found between an upper and lower bounds on the light input (and its corresponding ADP encoding), as illustrated in Figures 2 and 4. Robustness also breaks down at an extreme case when total PPDK levels exceed ADP concentration (PPDK T >> ADP), a condition that physiologically cannot be met due to the very high levels of this protein. In this case, cellular ADP levels are too low to allow further phosphorylation of the excess PPDK1. Consequently, the rate of PEP formation will be linearly dependent on PPDK total amounts (see Figure 1b, high end of the x axis and additional file 2). We also note that to be feasible, the robust mechanism must admit a positive and stable solution. Exact solution of the model shows that this corresponds to the condition Vk < Vp0, namely that the RP kinase rate is smaller than the phosphatase maximal rate (the rate in the absence of inhibition). Finally we analyze the detailed configurations of PPDK states within PPDK tetramers, when the robust mechanism is active. The robust mechanism involves the RP cycle catalyzed primarily by RP bound to two adjacent subunits of PPDK, one in PPDK2 form and the other in PPDK2 form. The abundance of this ternary complex relative to binary complexes is due to the avidity effect. When RP carries out a reaction, it changes the state of one of the two subunits that it binds: changing PPDK1 to PPDK2 or vice verse. It thus converts adjacent PPDK1- PPDK2 subunits either to two adjacent PPDK1 subunits, or two adjacent PPDK2 subunits. The action of RP therefore tends to convert neighboring subunits that have different forms to the same form. Analyzing this in a detailed model that tracks the different configurations of tetramers (see Methods), we find that the dynamics reaches a steady-state in which the configuration distribution resembles a bimodal distribution. 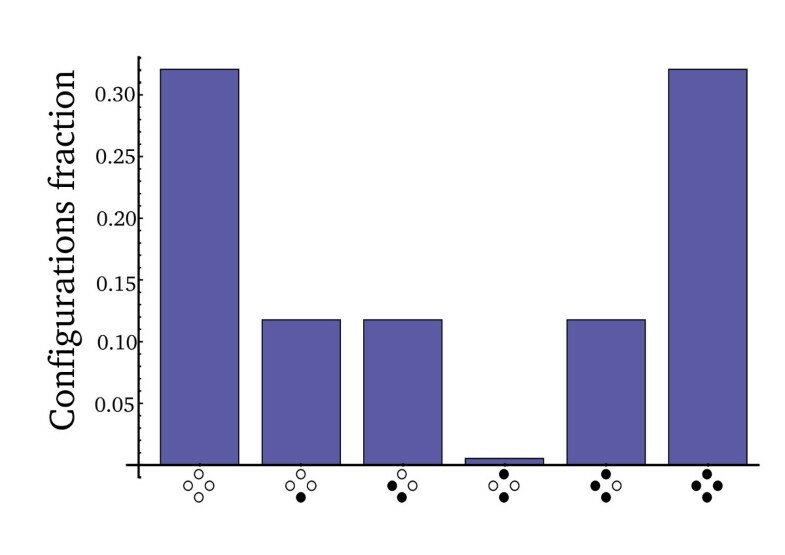 In this distribution, tetramers tend to be made of all PPDK1 or all PPDK2 subunits (Figure 5). These forms are slowly converted to other forms by RP binding to a single monomer (binary complex). The rarest forms are those with adjacent PPDK1- PPDK2 states, arranged in a "checkerboard" pattern. A quantitative analysis of the configuration probability distribution and its effect on the ratio of ternary to binary reactions is presented at the Methods section. Avidity model predicts a bimodal distribution of PPDK subunit phosphorylation states. Subunit state configurations were evaluated using a model of spatial arrangements of PPDK subunits. Presented is the steady-state fraction (see Methods) of each configuration of the PPDK tetramer. We focused only on configurations of either PPDK1 (marked in white) or PPDK2 (marked in black) subunits. Similar results hold for configurations where one or more subunits are in the PPDK0 state (see additional file 2). Model parameters are: Vp = Vk = 0.2 [koff1], kon2 = 200 [koff2] and total PPDK/total RP = 100 [11, 13, 33]. We also studied the effect of a three-state model on the different configurations, with 3 possible states for PPDK subunits, namely PPDK0, PPDK1 and PPDK2. We find that for the system to attain robustness it is beneficial that the two steps of the phospho-transfer have different rates. Only if the auto-phosphorylation of PPDK is faster than the phospho-transfer to pyruvate, the majority of the PPDK pool will transition between the PPDK1 and PPDK2 states and the ternary complex will dominate the modification reactions. Otherwise, the majority of the configurations will be in the PPDK0 state which hampers the probability for a ternary complex to exist. In-vitro measurements suggest that the auto-phosphorylation reaction is 1.5 faster than the phospho-transfer reaction . We find that this is sufficient for the avidity reactions to dominate the process, and for robustness to result. We presented a putative mechanism for robustness in the PPDK system of the C4 pathway in plants. The mechanism depends on avidity of the bifunctional enzyme RP to its multimeric substrate PPDK, and on a product-inhibition feedback loop that couples the system output PEP formation rate to the activity of the bifunctional regulator. The resulting output, PEP formation rate, is made insensitive to variations in substrates and protein levels. Despite this robustness, the output formation rate can be tuned by the input of the system, light levels encoded by ADP concentration. Robust control of PEP formation rate in the C4 cycle might be important in order to synchronize its action with the photosynthesis rate. The C4 pathway allows plants to increase their internal CO2 concentration near the carbon fixing apparatus. Good regulation can ensure an optimal balance of resources in the plant and help avoid reactive oxygen species accumulation . Robustness is predicted to break down at very high or very low light levels, or when PPDK concentration or the concentrations of its substrates are too low to provide the robust solution. In these cases the output formation rate becomes proportional to PPDK levels and catalytic activity. Darkness leads to a shutdown of PEP production (perhaps to a low basal level) to match the lack of photosynthesis. 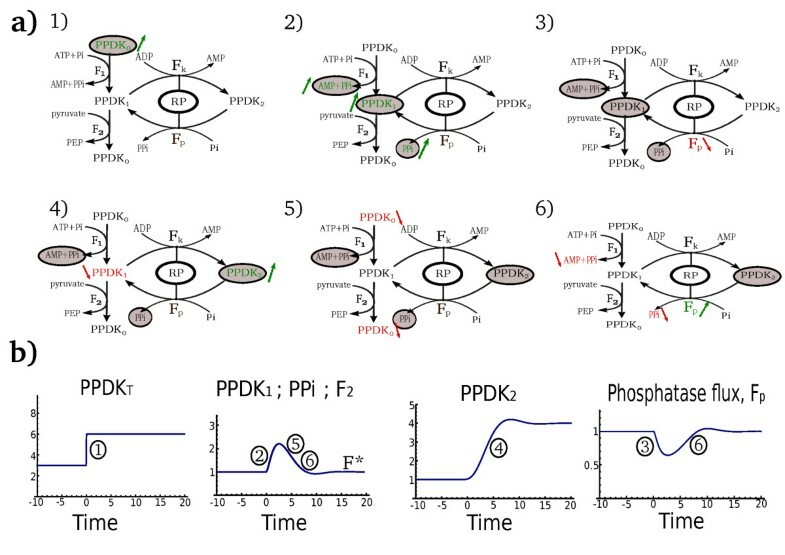 Shortage in substrates or PPDK enzyme leads to maximal activity of PPDK ). Our model also predicts that the robust rate solution F* (Eq.12) does not depend on the catalytic rate of PPDK. Thus, the PEP formation rate can be insensitive to temperature effects on PPDK specific activity. This feature of the model may explain the robust activity of PPDK observed in Maize across temperatures from 28°C to 45°C . One interesting question raised by the present finding is why should each cell be robust, when there are so many cells in the plant tissue that errors might be averaged away? A robust PEP formation rate in each mesophyll cell, despite the fluctuations averaging ability of the entire tissue, suggests that each cell may require the optimal rate level at each given conditions. Being above or below this optimal level may cause damage to the cell, or reduce its growth ability. For example, ATP is needed both for carbon fixation and for biosynthesis. An unnecessary consumption of ATP by an error of too much C4 cycle carbon fixation rate could hamper biosynthesis. Similarly, reduced PEP formation rate (and thus higher levels of ATP) would reduce carbon fixation rate and therefore cell growth. Because of such effects, fluctuations at the single cell level may not average out but rather decrease the fitness of the entire tissue. The PPDK mechanism is readily testable by experiments that test PEP formation rate as a function of enzyme and substrate levels in plants. Experiments can also test the breakdown of robustness predicted at extreme light levels and very low levels of enzyme or substrates. One can also test the importance of avidity by studying mutant mono-functional versions of the bifunctional enzyme RP . More generally, the suggested mechanism provides a context for the unusual set of biochemical features in this system. When considered together, these features have the potential to perform a systems level function: providing robustness with respect to fluctuating components and at the same time responsiveness to the input signal. The presented PPDK mechanism is a new way to achieve robustness using product inhibition as a feedback loop on a bifunctional regulatory enzyme. This mechanism exhibits robustness, being insensitive to variations in protein and metabolite levels as well as to catalytic rate changes. At the same time, the output of the system remains tuned to input levels. A more detailed model that takes into account the spatial configurations of PPDK0, PPDK1 and PPDK2 in the tetramer is provided in the next section. The detailed model shows similar results for robustness, and makes further predictions on the correlations of the states of adjacent monomers. These equations were solved analytically using the fact that PPDK concentration is much higher than RP levels (more than a 100-fold higher [13, 33]). The avidity effect allows us to assume that the on-rate for RP bound to one monomer to bind an adjacent monomer on the same tetramer is very large, due to the increased local concentration (kon2, kon3 >> kon1 PPDKT, kon4 PPDKT). Also, off-rates are assumed to be much faster than enzymatic reactions rates as is the case for most enzymes (in-vivo experiments suggest that full activation/de-activation occur on the scale of 10-60 minutes, therefore phosphorylation/de-phosphorylation rates are in the range of 1-10 [1/sec], compared to koff rates on the scale of 1 msec [13, 20, 11] thus Vp, Vk << koff1, koff4). Analytical solution of the model was obtained using Mathematica 7.0. This prevalence of the ternary complex breaks down only when the probabilities p1 or p2 become small, on the order of 1/A where A is estimated to be on the order of 100 [11, 22, 34]. where Vk0 and Vp0 are effective rate constants dependent on enzyme catalytic rate and on/off rates. For Figure 4, these equations were solved numerically for different concentrations of PPDK total amount using Mathematica 7.0. We finally note that perfect robustness (complete insensitivity) to all protein and metabolites is an idealized feature. One may ask whether it persists if one adds additional reactions which have been neglected due to their small relative rates. We find (see additional file 2), that adding such reactions (e.g. the contribution of the binary complexes, the contribution of other reactions that make AMP and PPi) preserves approximate robustness: if the rates of these reactions are on order of a small number ε relative to the corresponding reactions above, sensitivity to proteins and metabolites is no longer strictly zero but is small, on the order of ε. We also note that the dependence of Vp0 on Pi levels is neglected in this discussion due to the high and buffered Pi levels in the cell, making this metabolite unlikely to fluctuate as much as other metabolites [36, 37]. We developed a model in order to study the binding of RP to the four subunits of PPDK. For a ternary complex to form, RP must bind a PPDK1 and a PPDK2 that are neighboring subunits. It then can catalyze either phosphorylation or de-phosphorylation. Each PPDK subunit has three conformations possible: PPDK0, PPDK1 and PPDK2. Taking into account the symmetries of the tetramer there are 21 possible configurations. The probability for an auto-phosphorylation reaction of a PPDK0 subunit is denoted by δ1 and the phospho-transfer reaction by δ2. Therefore, in order to have accumulation of PPDK1 and PPDK2 subunits, δ1 should be greater than δ2. Solving the Master equation yields the fraction of each configuration at steady-state. We find that the avidity mechanism favors clustering of the PPDK1 and PPDK2 subunits. Thus, PPDK1 and PPDK2 subunits tend to be maximally spatially separated. The following simplified model allows for an analytical estimate of the configurations distribution at steady-state for arbitrary protein's size. As shown from the solution of the Master equation (see previous section), the dominant configurations are ones where the modified and unmodified subunits cluster together and are phase separated. Therefore we consider only transitions between these states. The probability for a certain configuration state is denoted by its amount of modified subunits, namely, N(0) is the probability for the configuration where all subunits are unmodified, N(1) is the probability for a configuration with one modified subunit and so on. We further assume that for all states which are not fully modified or unmodified, reactions from the ternary complex are dominant and thus neglect binary reactions from these configurations. The modification reaction rate from a ternary complex is denoted by η1 and de-modification reaction rate from a ternary complex is denoted by η2. Similarly, modification and de-modification reaction rates from a binary complex are denoted by ε1 and ε2 respectively. It is thus evident that the ratio between the boundary states to the 'bulk' (i.e. all configurations with partial number of modified subunits) is of order ε/η. This ratio can be viewed as the energetic cost of shifting the boundary between the two domains of modified and unmodified subunits. Also, it suggests (as the Master equation solution indeed indicates) that the neglected states with two or more boundaries between domains are of order (ε/η)^2 and higher, depending on the number of domains. The avidity effect stems from the ability of the bi-functional enzyme to bind neighboring modified and unmodified subunits. The modification or de-modification reactions are thus limited to proteins that have mixed pairs of modified and unmodified subunits. Here we solve a toy model of the avidity process to assess the dependence of the ratio of ternary to binary reactions on the number of protein subunits. Following the analysis of configuration states (see above section), we assume that most proteins are phase separated (where a sequence of modified subunits is followed by a sequence of unmodified subunits). Hence, the number of modified subunits is characteristic of the protein state. We also assume that transitions between states with mixed subunits (modified and unmodified) are committed from a ternary complex due to the enhanced local concentration caused by the avidity effect. Therefore, modification and de-modification reactions occur only from the "edge" states when the protein's configuration is either fully modified or unmodified. We define the mean number of steps to reach one of the boundaries (all modified/all unmodified) as M(i), meaning M(1) is the mean number of steps to reach the boundary from the state of one modified subunit, M(2) is the mean number of steps to reach the boundary from a two modified subunits state and so on up to M(N-1). Each state has a probability p to commit modification and (1-p) to commit de-modification. Therefore, near the steady-state the ratio between ternary to binary reactions is proportional to the protein's number of subunits. To confirm this result, we run Monte-Carlo simulations where the number of proteins is two orders of magnitude larger than the number of bi-functional enzymes. We further assumed that there is an equal probability for modification and de-modification and that only states of fully modified and fully unmodified can react from a binary complex. The numerical results indeed show that the ratio between ternary and binary reactions is proportional to the number of protein's subunits and goes as (N-1) where N is the protein's subunits number. We thank our lab members for fruitful discussions. YH thanks Naama Barkai and Tsvi Tlusty for insightful comments. This work was supported by the European Research Council, and the Israel Science Foundation. YH, AM, RM and UA conceived the study and participated in its design. YH, AM, RM and UA analyzed theoretical models and numerical simulations results. YH, AM, RM and UA drafted the manuscript. All authors have read and approved the final manuscript.